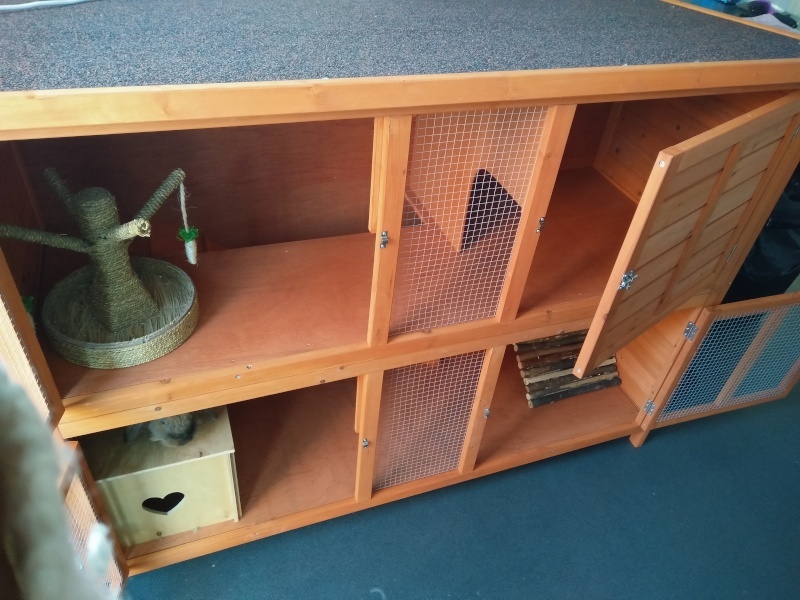 Yip finally decided what new abode to go with and we went for a two story hutch it's the same width as the have but longer and obviously higher. It is currently sitting in the hall needing assembled which is on today's things to do. Please let us have a piccy when you have finished hun. Ha ha, is that a cute little nose I can see? Great set-up love, thank you for taking the time to show it to us. I am sure he will work it out soon hunni, they are smarter than we give them credit for LOL!! Put him in the top floor so he'd have to come down it now he drops his ball not a soft ball but his hard bell ball down the ramp takes it back up the ramp to throw it back down. So John night terrors, Miranda was syringe feeding and soundwave ball they work it out between them so that they didn't do it on the same. Ha haa, sorry love I shouldn't laugh, I bet that the constant hard ball bouncing gets a little irksome LOL! !